Blue Cactus, a retro-tinged country band from Chapel Hill, don’t only sing about heartbroken pain. But it is one of their areas of expertise. The singing pair of Mario Arnez and Steph Stewart had worked together in another project, a string band, before forming Blue Cactus. They had been through breakups of long-term relationships when they began working on the material that made up Blue Cactus’ self-titled 2017 debut. The band functions as a duo much of the time at live outings, though their studio material is wonderfully fleshed out with a rhythm section, pedal steel and impressively restrained tempos. They’ll play Petra’s in Charlotte on Feb. 15, with Sinners & Saints, and Vilai Harrington & the Hamptones. I spoke with Arnez and Stewart by phone recently from their home in Chapel Hill. Heartache never gets old. Or, at least, people never grow tired of singing about it and listening to songs about romantic turmoil, faded love, somebody doing somebody wrong, or just crying from lonesomeness. Country music is especially good at devising thematic permutations to cover all the varieties of heartsickness. Drinking songs and truck songs and hometown songs are often just a way of leading back to the same subject. Stewart and Arnez were drawn to golden country from the ‘60s and ‘70s, with a residual hint of honky-tonk swagger, along with the growing sophistication of lush production touches, and countrypolitan flourishes that followed. You might think of classic duets between George Jones and Tammy Wynette, or Loretta Lynn and Conway Twitty, Buck Owens and Rose Maddox, Porter Wagoner and Dolly Parton, or maybe Glen Campbell and Tanya Tucker. But Blue Cactus don’t do much of that sassy verse-trading that was a signature of those songs. On stage, Stewart and Arnez are likely to sport some nifty Western duds, with embroidered designs, high-contrast fringe, pearl snaps, meticulous stitching and a general cowboy snappiness. It’s a kind of visual showmanship, a way of signaling that they mean business, and a nod to tradition. But just because you put on a Nudie suit doesn’t mean you’re living in some rhinestone-spangled nostalgia kingdom and playing by the Grand Ole Opry formula. Aspects of country music have been filtering back and forth across the American music since the genre became a recognizable thing. The Cosmic American Music idea hasn’t vanished from the scene since the Flying Burrito Brothers gave it a lift off. 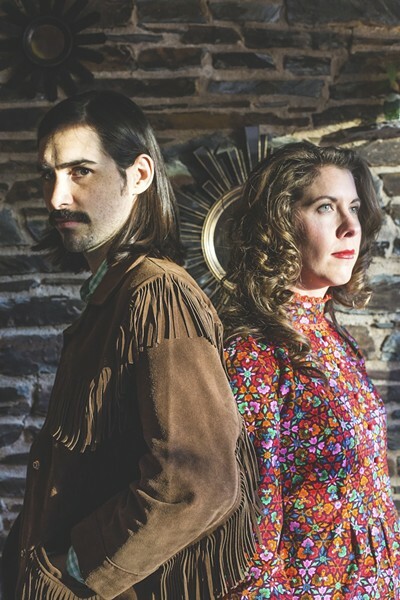 Blue Cactus’s songs scoot away from standard country form in a number of ways. There are surprise chord changes, unexpected meter switcheroos and dramatic gaps, silences and pauses that inch up the tension-and-release factor. Listen to “Anymore Something (Like Anyone’s Someone).” It’s got a lot of little whiplash accents and jump-cut shifts in the time feel. If country music is often about familiarity and comfort, this is more like having the rug artfully pulled out from under you without even noticing it. Arnez says he stays on the lookout to avoid being too predictable. “If I’m in the middle of writing something and just get an impulse that things are starting to get phoned in, maybe that’s just a gut reaction that I need to mix it up,” he said. Classic country isn’t known for its speeding tempos, but even with that in mind, one of the things that catches your ear and maybe your breath about Blue Cactus is the way that they can keep a song up and running at an ultra-slow trapped-in-amber feel, like on “Forever (Never Happened For Me).” You could compare it to snail-pace country classics like Charlie Rich’s insanely chill “Life Has Its Little Ups and Downs,” but you might just as reasonably draw a connection to indie rock bands like Codeine and Brightblack Morning Light, bands that turned a narcotized time-feel into an entire aesthetic. Last fall, Blue Cactus released a new single, “Radiohead,” a song that continues in that slow-drip mode. Stewart sings with a captivating, gritted-teeth intensity and tremble. Arnez plays some lovely bright and snarling Telecaster. Fans of the Jayhawks, Father John Misty, and Aimee Mann will appreciate what Stewart and Arnez are up to. Fans of William Tyler and Gillian Welch will find plenty to enjoy, too. Stewart and Arnez are going into the studio at the end of next month. Now that they’ve presumably recovered some from the heartbreak and heartache that they had experienced when they started working on Blue Cactus, the pair are off into other interesting territory. Based on the sound of “Radioman,” there may be a little less twang and drawl in their next batch of songs. But the sound still hints at the vastness of the American landscape and the same big corresponding geography of emotion and memory. Like most songwriters, Stewart and Arnez spend a fair amount of time pondering the mysteries of what makes a good tune—how best to craft the component parts, when to leap up, when to drop back, how to tell a story that’s specific and yet universal, how to mix a little humor in with the pathos, how to be simple without being boring, how to add complexity without weighing things down with frills, how to be honest and connect with people. Those are all things that most good music and good songs. How you think about the genre trappings is a mental puzzle.